Salzburgers are a white or European people identified or identifying as Austrian, sampled in the Central European country of Austria. The White – Austrian – Salzburg region population data represent DNA samples from 194 unrelated caucasian individuals in the Salzburg region of Austria. Samples were provided by the Institute of Legal Medicine located in Austria’s capital city of Salzburg. For more details on this population, see: Austrian people. Photo: Romy Schneider, actress who was born in Vienna, Austria to an Austrian father and German mother. 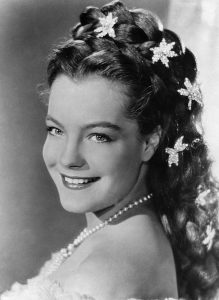 Photo is of Romy Schneider smiling as Elisabeth of Austria in the film Sissi. 1955. Photo by Unknown (Mondadori Publisher), Wikimedia Commons. Source publication: Nine STR Markers Plus Amelogenin (AmpflSTR Profiler Plus): A Forensic Study In An Austrian Population, IJLM, 1999, 113, p60-62.